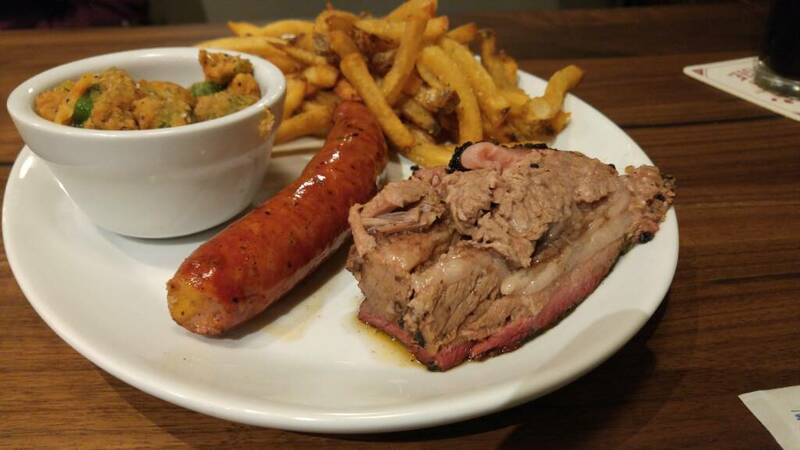 A couple of weeks ago I read a review of Lakewood smokehouse from the Dallas Observer. I was impressed with the pics I saw and what they had to say, so I decided that I would give this place a shot the next opportunity I had to go out to eat. So when my wife asked me if I minded if she went out to have dinner with her girlfriends this last Friday, I quickly obliged and made my plans to go have some bbq with my partner in BBQ, my 14 year old daughter. If you have read any of the BBQ Advocates thread, you have probably noticed that I'm pretty passionate about both cooking and eating bbq. I've passed that love on to my daughter who is quite the critic. We have done a few bbq crawls together, so having the opportunity to have a night out, just the two of us enjoying some bbq, sounded like the perfect Friday night to me. 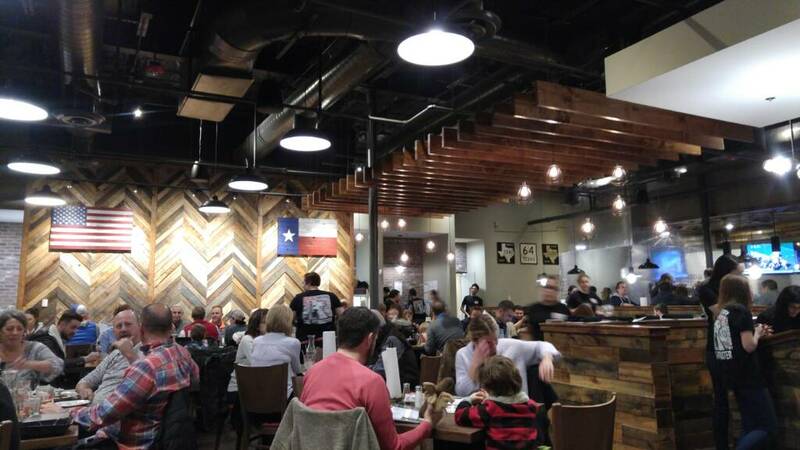 Lakewood smokehouse is in East Dallas, not too far from uptown and is partly owned by Jason Hall, the owner of Frisco's 3 Stacks smokehouse. Once I read that, I knew this would be more of a typical restaurant, than a good ol bbq joint. Lakewood is open late on weekends, so I let traffic die down a bit on Friday night before we started the long drive. We arrived about 7:15 and much to my surprise, the parking lot was full and there was a wait to get a table. We put our name on the list and were told it would be a 30 minute wait. There was not much seating for those waiting, so I ended up standing the whole time. There is a pretty decent sized bar there, and that appeared to be where most went to kill time while waiting on a table. Upon being seated it took a few minutes before our waitress stopped by to take our drink order. She stumbled her way through the conversation. She was a nice young lady, but it was apparent that conversation did not come easy to her. After drinks were dropped off, it took at least 5 minutes before we saw her again. For a pretty small restaurant, I would have expected a bit faster service, but they are new and still trying to get things figured out. I am a huge fan of beef ribs. 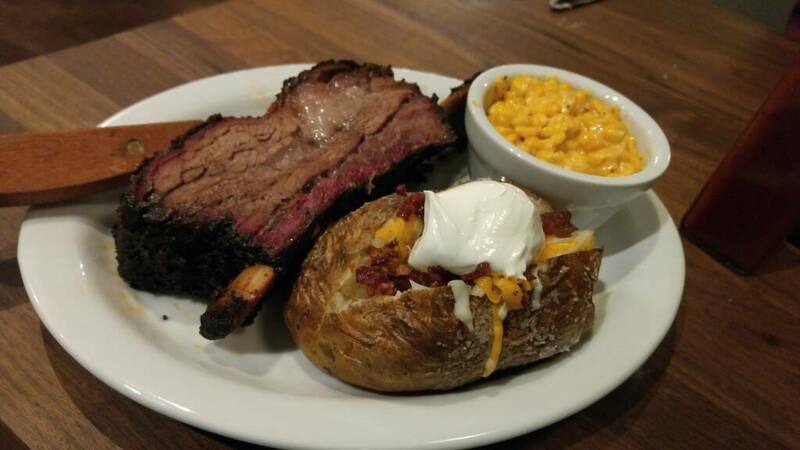 If you have ever checked in on Facebook at Hutchin's Bbq in Frisco, you have seen my picture of a big beautiful beef rib served to me at Hutchin's back when they were on the menu. So, as soon as I saw they had a beef rib plate for $19 with two sides, I knew just what I was going to order. My daughter is all about moist brisket, so I suggested she get a two meat plate so that we could try the poblano cheddar sausage that is made for them by Rudolphs meat market in Deep Ellum. Within 5 minutes of placing our order, our meals arrived which made me very happy, as I had been watching everyone else eat bbq for nearly 45 minutes. I was a professional photographer before we moved to Frisco, so I am all about the visual appeal of food, especially bbq. I've eaten enough good and bad bbq that I can pretty much know if I'm going to enjoy my meal, just by looking at it. So when our meals arrived, I was immediately let down. My big beef rib was small and there was a chunk of unrendered fat in it that took away a third of the rib once I cut it out. It was basically the same amount of rib that you would get from a beef short rib. I knew right away that it also hadn't been cooked long enough to allow all of the fat and connective tissue to break down which results in a rib that is soft as room temperature butter. I had to cut my bites from the rib as if it were a steak. As for the sides, I ordered a baked potato and cheesy corn. I loved the corn, but the potato was just meh. A typical steamed potato with little flavor. Now on to my daughters plate. I was immediately disappointed in the moist brisket. It didn't look appealing at all, similar to what I would expect from a place like Dickeys bbq. It was painfully obvious that there had been little to no trimming of the fat on the brisket before or after smoking. To my surprise, the brisket came away from the fat really easy, letting me know it was a well cooked brisket. It was super tender letting me know the pitmaster had some skill. Unfortunately though, the taste was unremarkable. It had little seasoning on it and just a hint of smoke. As for sides, she got fries and fried okra. The fries were typical fries, but the okra was really good, and I'm not really even a fan of okra. The star of the show by far was the poblano cheddar sausage. It was really appealing to the eye and had great flavor. We wished we had just ordered several of these. Our waitress stopped by a few more times but never asked what we thought of our meal. I was hoping to speak to the manager about our meal, just not enough to seek him out. After paying the bill of $40, I could not help but wish that we had kept our money in Frisco and saved the gas by going to Hutchins where we are always happy. I had to give it a shot though. You never know if you don't try, so it is what it is. I got to spend a night with my daughter eating bbq, so it was still a win for me. Thanks for posting the review. I got excited when I saw a new BBQ place was coming. Then I saw it was from the 3 Stacks people…that was enough to tell me not to go out of my way. Ha I've never had a bad meal at 3 stacks. 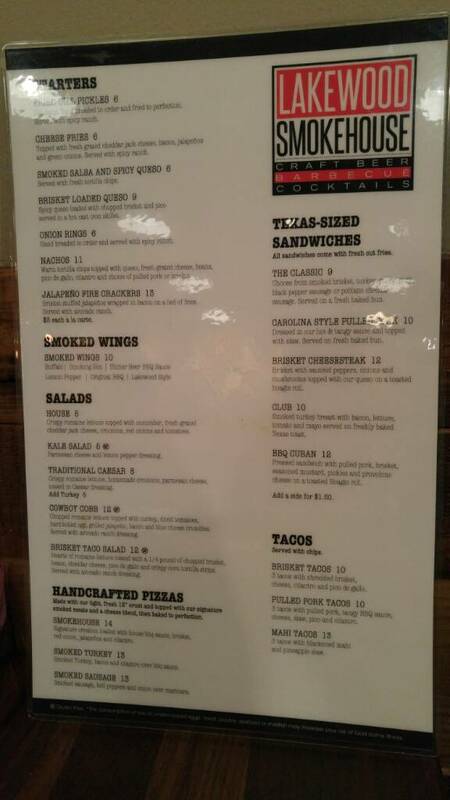 Raider18 wrote: Ha I've never had a bad meal at 3 stacks. Thank you for the review and TOFTT - Never know it may have been awesome. 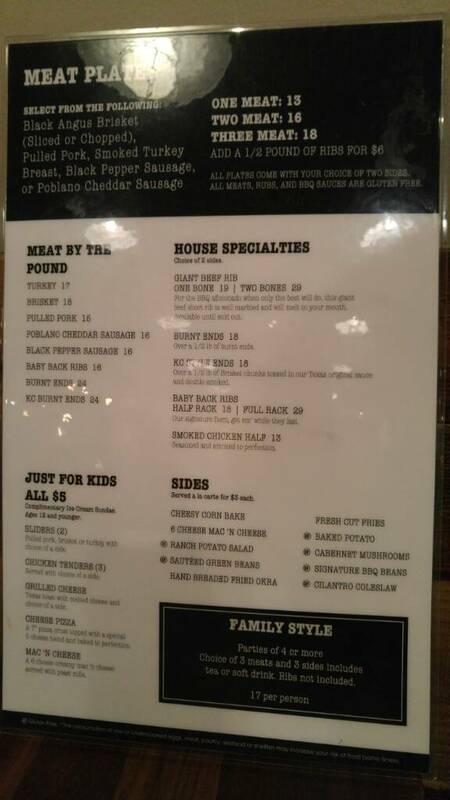 Can you buy the Sausage at Rudolphs ? I have a photo shoot in Deep Ellum this friday. cowboydon wrote: Thank you for the review and TOFTT - Never know it may have been awesome. Can you buy the Sausage at Rudolphs ? I have a photo shoot in Deep Ellum this friday. I have no idea about the sausage. Did you go try to buy any on Friday? I live close to the Lakewood Smokehouse so I took my lady friend to give It a try. The bad experience started in the parking lot. When I got out of the truck I could smell a bitter, dirty smelling wood smoke. Not a good sign. Inside, I couldn't smell it so I was trying to keep an open mind. They think highly of their burnt ends so I gave them a try. My friend ordered brisket. Potato salad and BBQ beans for the sides. Well, my worst fears were realized. The burnt ends were black and bitter. They had a creosote taste. Same for the brisket. The potato salad was bland and the beans were OK. Well, that the way It goes sometimes. Not every place is a winner. I just won't be going back. The story does not end here. The waiter came around and noticed we did not finish and asked what was wrong. So I took the time to explain to him that they had a problem with their fire in the pit. That it was burning dirty and the food was bitter and had a creosote taste. In a minute, here comes the manager. I expected maybe an explanation and being asked to come back. What I received was the manager explaining that he checked the pit and it was OK. He went on to tell me that I didn't know what burnt ends are. He explained that they are heavily smoked and are always black. I just nodded, payed my check and left. To me there's no excuse for a professional BBQ restaurant to not be able to build a good fire. And no excuse to be condescending when explaining that burnt ends are always black and taste like creosote. If this had been a family restaurant I would go back later and give them another chance. Everyone can have an off day. However, this is a high-end BBQ restaurant and being told that my lack of BBQ knowledge is the only problem. I won't give them another chance.